The demand for chiller/heater combination units has been existent for many years. However, the applications which use such equipment are rarely the same. With years of experience designing chiller/heater units for client-specified process applications, Whaley decided it was time to produce standard chiller/heater combination units for clients to use as a base design for their chiller/heater applications. The configurations will be designed to allow for elaborate customizations to allow fulfilment of any and all project requirements. Whaley is in the process of designing standard chiller/heater combination unit product lines which will serve the following applications. 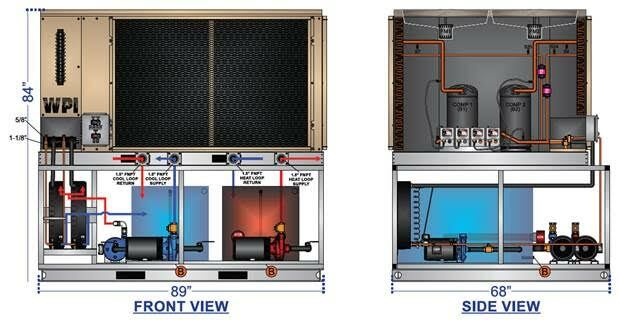 o Applications which require a chiller/heater unit that can serve chilled water to a first application loop while simultaneously and independently serving heat to a second application loop. These applications will use a traditional chiller unit with secondary internal heating loop all on one frame, but with completely independent controls. o Applications which require a chiller/heater unit that is capable of either cooling or heating an application loop, but not simultaneously. These applications will be served with a heat pump product line which incorporates a refrigerant reversing valve which allows the unit to reverse which of the coils are used as condenser and evaporator. o The third and final configuration will be the temperature control unit design. This product line will be designed to maintain one single process application loop between X temperature and Y temperature, no matter if the application requires heating or cooling. The customer will have the ability to set a desired temperature range for maintaining the temperature, and the Whaley TCU unit will do the rest. The Whaley TCU unit will automatically cool the loop when it needs to cool, and heat the loop when it needs to heat.